Want to skip to the payoff? 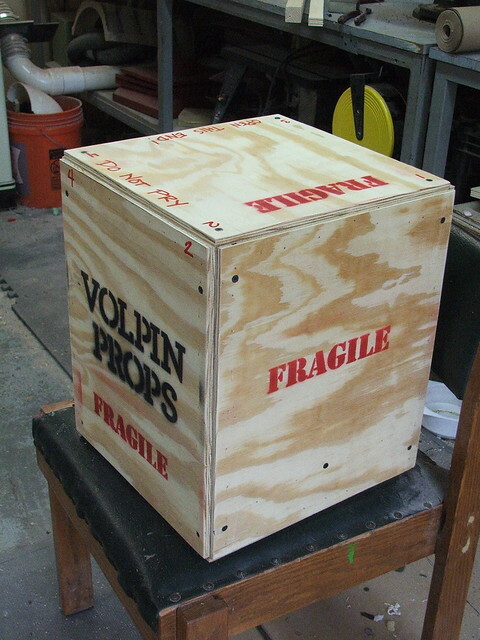 Check out my shipping crate calculator over here! 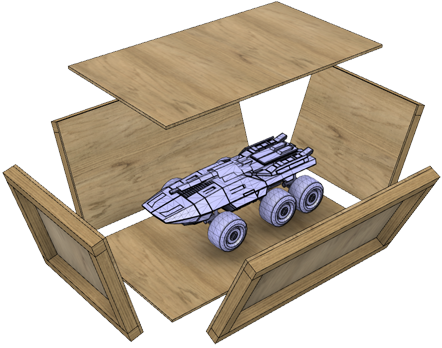 The blog post below will detail how to construct the parts into a complete shipping crate. Super huge thank you to my Patreon supporters Will and Skye for making my pen-and-paper formula into a robust online tool! I’ve used it for my last five crates and damn does it make things easier than doing all the math by hand. First examples were rough, with sporadic success. 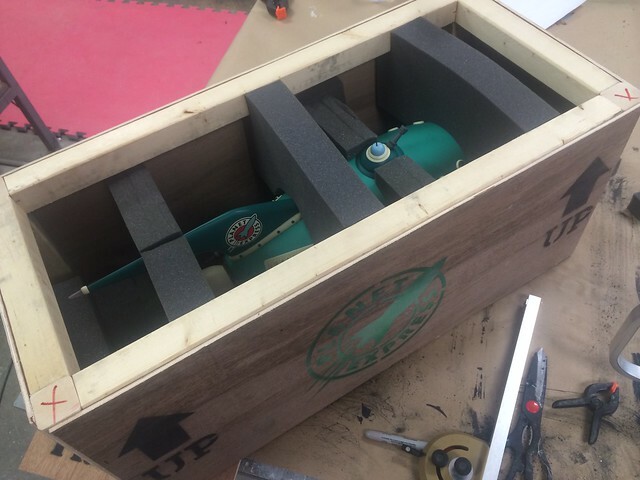 Three gravity guns shipped perfectly fine in a configuration of 1.5″ lumber and 3/16″ luan board, but similar crates made for Planet Express ships had bad luck. Narrow props like rifles were a snap. 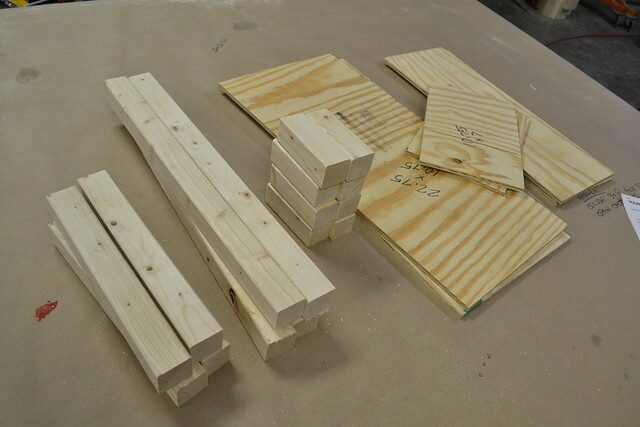 A set of 1x4s arranged in a box shape with 3/8″ ply top and bottom and you’re good to go. Heavy, but robust! 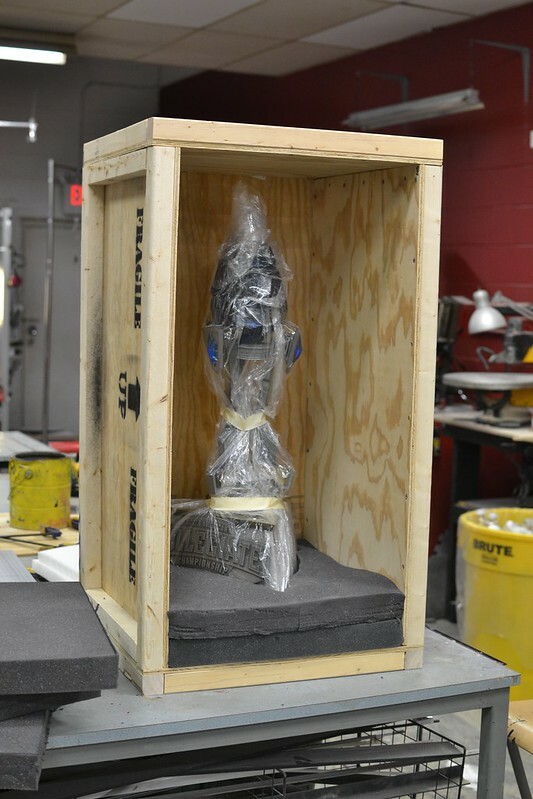 When you have to ship something like this, however, things get a little trickier. 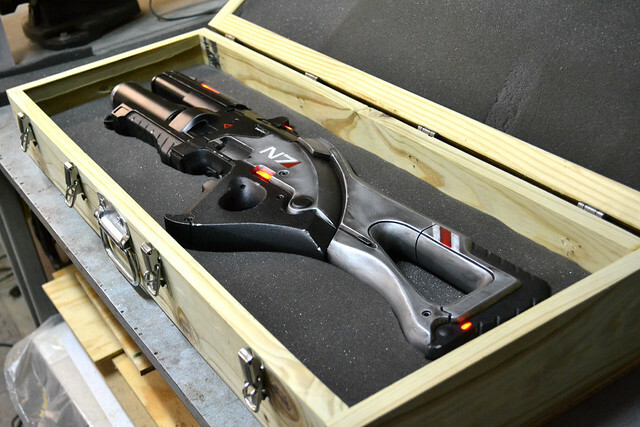 Eventually I settled on a configuration like the photo below. 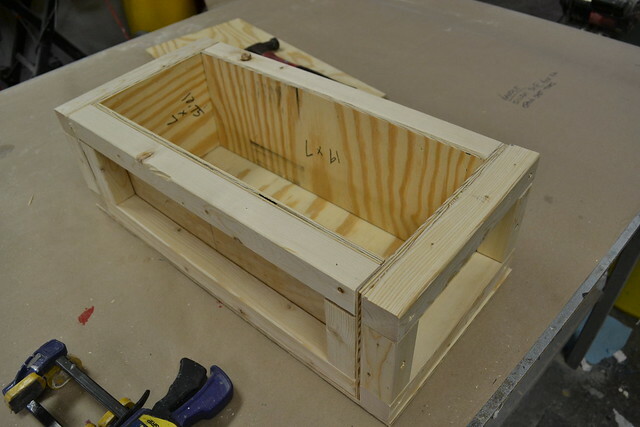 These are quick to create, structurally very sound, and provide a smooth box for the interior so there aren’t any odd protrusions to be concerned with. Also the external supports make lifting and handling much easier. The basic construction is a series of four 3/8″ thick plywood panels framed with 1.5″ x 1.5″ lumber supports. Don’t worry if you’re not using USA Freedom Units – the calculator has a toggle for metric also! 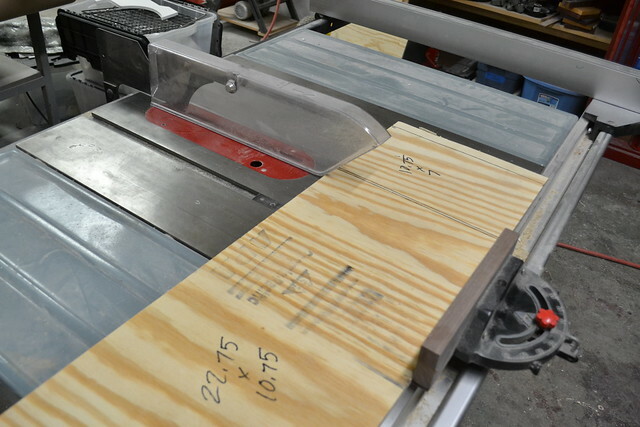 Plywood and lumber are cut to shape on a table saw. This can also be done with a circular saw or even a jigsaw if you’ve got the patience for it. 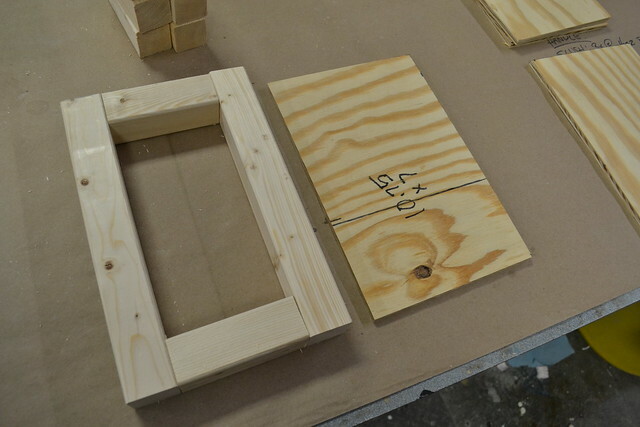 Frames are constructed by setting up a box of 1.5″ lumber, then nailing the plywood over the box with some added wood glue for strength. Repeat this for all four frame sections. 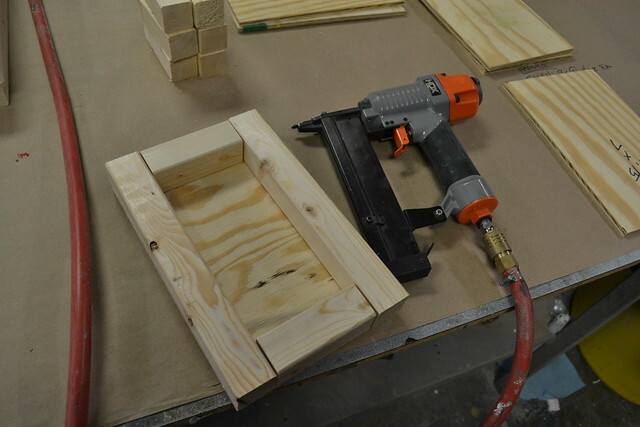 To make the box proper, use a series of 2.5″ wood screws to anchor the frames to one another. 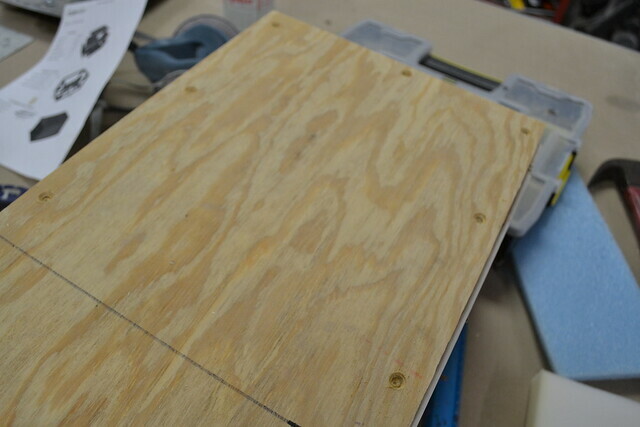 I add some wood glue to these seams as well. 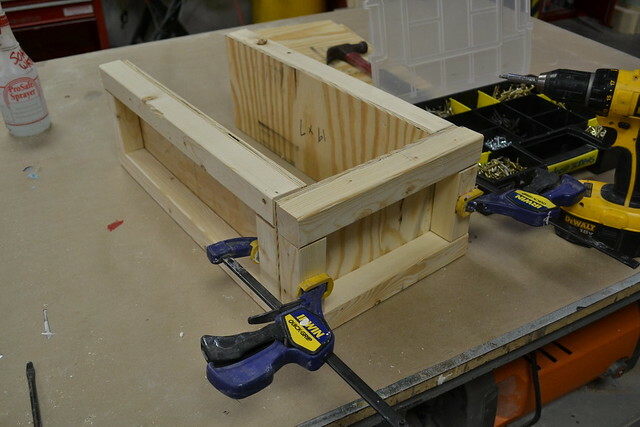 A set of clamps will help keep everything in place during assembly. After all four frames are joined, the base board can be screwed down. Use more wood glue here! This piece is anchored with 1.5″ torx screws, while the top lid is secured with 1.5″ phillips screws. The different screw types ensures nobody accidentally tries opening the wrong side. Screw positions in the lid are countersunk ahead of time to minimize any screw heads poking out and snagging clothes and fingers. For padding, every project will be different. 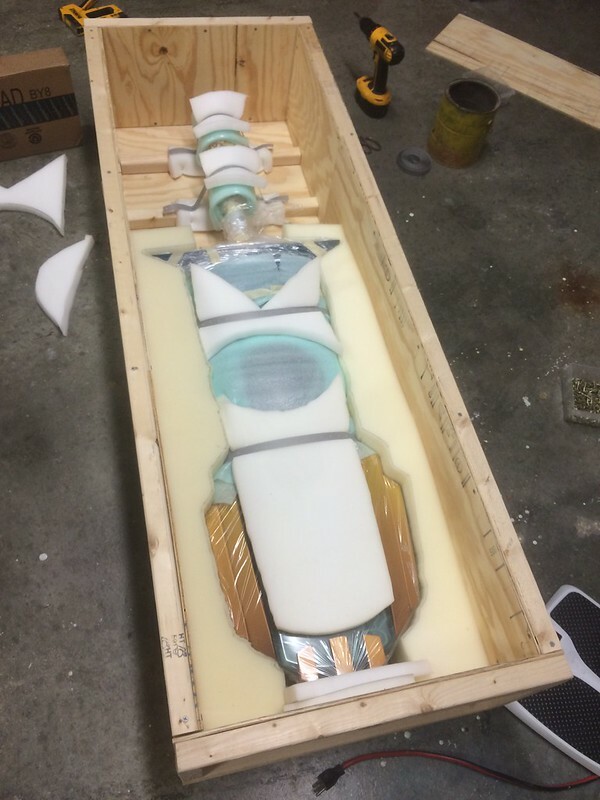 For some larger and more intricate forms I prefer cutting some 2″ thick poly foam with a hot wire foam cutter to the shape of the prop in various sections. 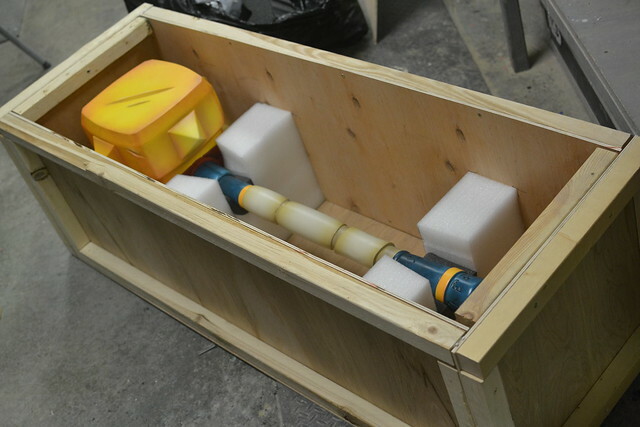 One half will be permanently glued into the crate, while the other section can be slid out for removal later on. 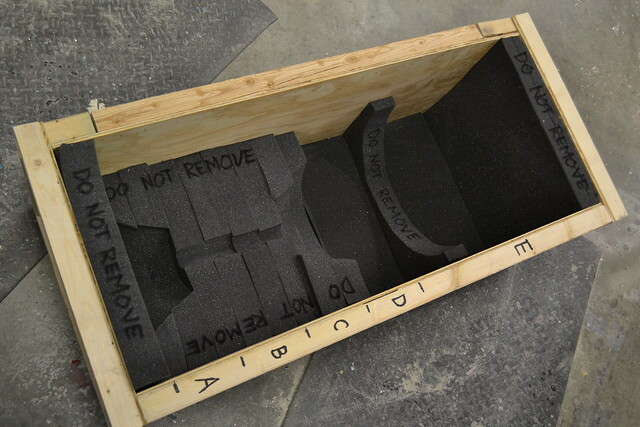 Very large props would require an expensive quantity of foam, so these typically have a set of stiff foam “ribs” which isolate the piece and position it sort of “floating” in the crate. 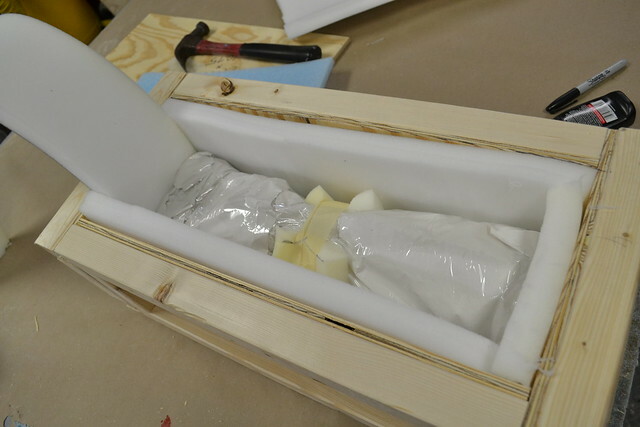 Large voids are then filled with packing peanuts or bagged air for additional padding. Smaller pieces or less complex forms get wrapped in a polypropylene bag, then wrapped in bubble wrap and shrink-wrapped. 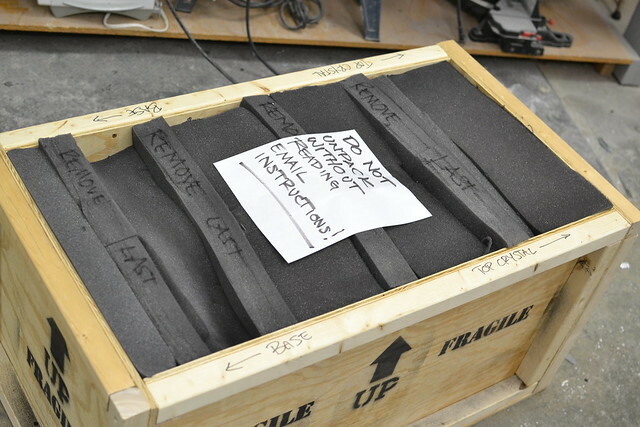 These are then placed in a foam-lined crate and filled with packing peanuts before sealing and shipping. A note on bags: I wrap my props and trophies in polypropylene dry cleaning bags. 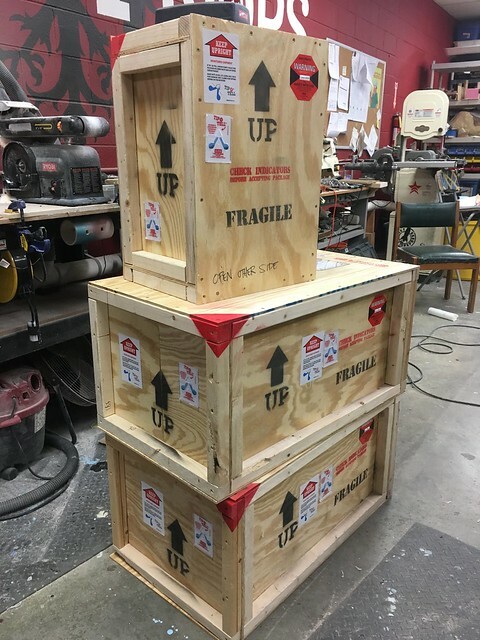 This plastic is specifically designed to not bond with any other poly plastics or paints (like the materials and dyes used on clothing) and therefore will keep the surface of your piece free from scratching and damage in transit. Do not use grocery bags or trash bags! These can and most likely will bond to your paint and clearcoat, potentially ruining your replica. Label time! 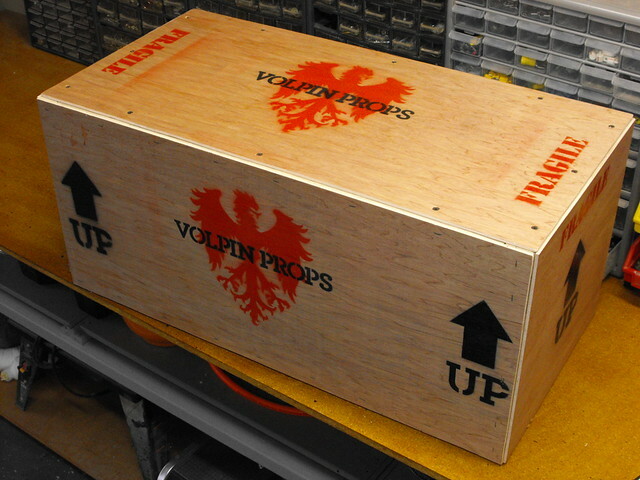 I made a bunch of stencils (UP, FRAGILE, etc) that get peppered over the surface of the crate. 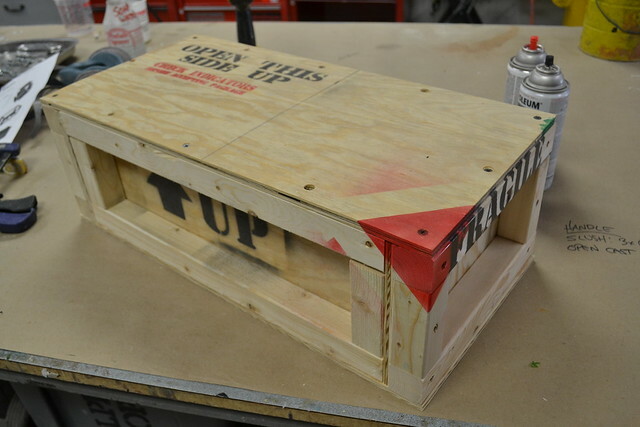 The red corner is an alignment marker and helps get the lid in the proper orientation for reassembly if the crate needs to be shipped again. Plus, it looks neat. The final bit of insurance is a set of shock watch and tip alert sensors. 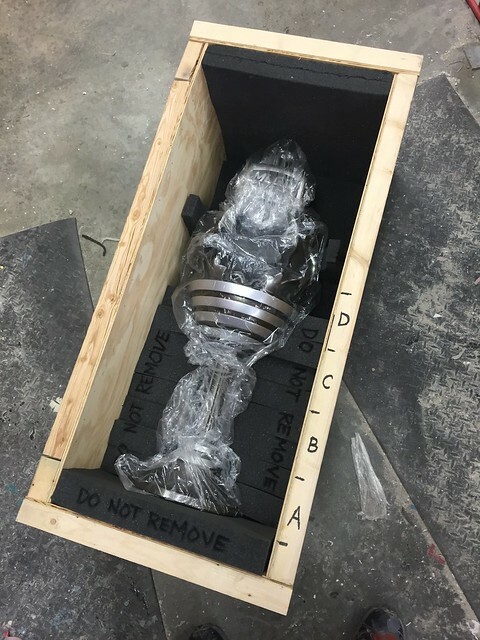 This may be considered overkill, but if a shipping company damages one of your pieces they’ll send an insurance adjuster out to inspect the packaging once you’ve submitted a claim. Being able to point at a red tag and say “you subjected this to 50G of force while it was upside down” will go a long way toward convincing them your package was mishandled. Here’s the thing about shipping: most packages are damaged by machinery and other packages way more often then they’re broken by people. 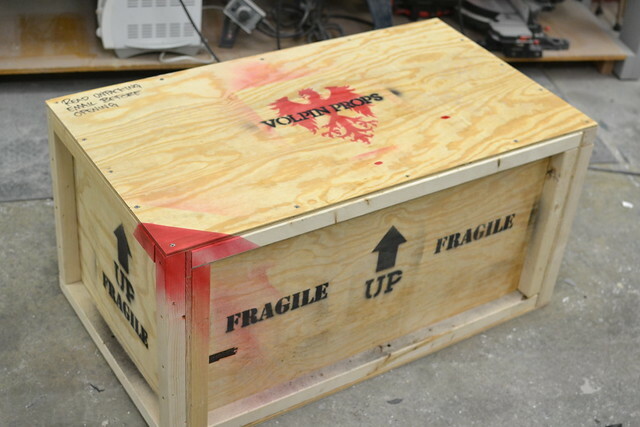 If you make a shipping crate robust enough to survive the conveyor belts and (possibly) the massive shipping crate next to it, your props will arrive safe and sound. Perhaps the best part of this design is scalability. 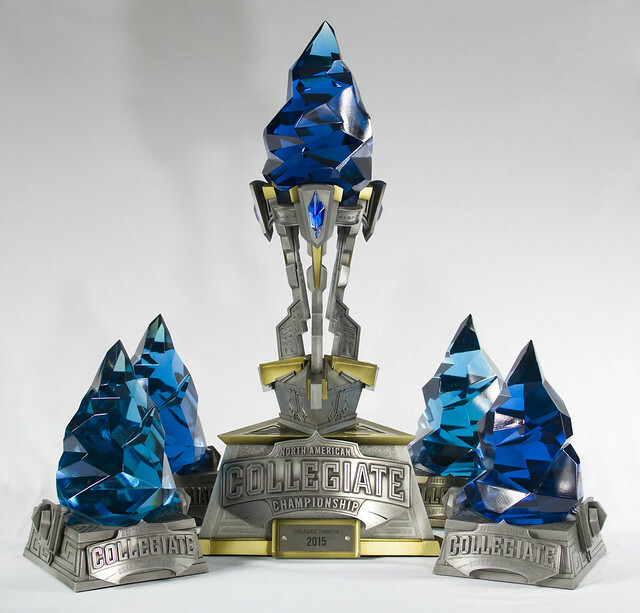 The same formula can be used to make a crate for a small handheld trophy, or a 5′ tall glowing, talking sword! Hope this helps all those props out there waiting to be shipped. Happy building, everybody!